Castlebar is rich in history and is also County Mayo's largest town by population. Centrally located, Castlebar enjoys access to the county's many attractions and is popular with shoppers from all over West Ireland. 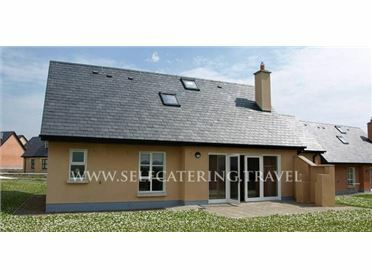 In addition, the town also boasts a variety of restaurants, pubs and other amenities, including the Royal Theatre and the 18-hole Castlebar Golf Club. Oil central heating with multi-fuel stove. Electric oven and hob, microwave, fridge/freezer, washing machine, dishwasher, TV with Free-to-air channels, DVD, CD/radio, selection of books, games and DVDs. Fuel, power and starter pack for stove inc. in rent. Bed linen and towels inc. in rent. Travel cot and highchair on request. Ample off road parking. Courtyard and patio with furniture and BBQ. Shared use of owner's lawned garden next door. Sorry, no pets and no smoking. Shop and pub 2 miles. Note: Some internal steps, cottage may not be suitable for those with mobility issues..